They offer unique challenges since the goal is not simply to sell items but also to get the audience excited about the mission of your organization. We inspire the audience so they bid high and bid often! Picking the right team to motivate your guests to open their checkbooks will pay for itself! As professional auctioneers, we will generate more revenue, communicate your mission, and make the evening more enjoyable for your guests. Organizations believe they will save money by using a volunteer or a local celebrity to run the auction. While using a volunteer rather than a paid auctioneer may seem like a less costly option, your organization will lose revenue. Novices leave money on the table because they are not able to maximize bidding. Similarly, Benefit Bidding also provides professional ringmen (Auctioneer Assistants) instead of relying on volunteers. 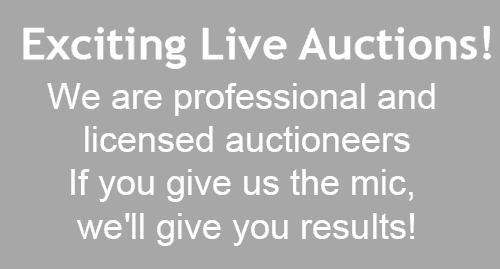 Professional ringmen are trained on how to properly assist and communicate with your guests during the live auction. They are auction stimulators and are valuable members of the auction team. They know how to entice the guest to bid a few more times on an item which greatly increases the money raised during the live auction. For these reasons, the contributions made by professional ringmen at a benefit auction are more valuable to the fundraising efforts than a volunteer staff of bidspotters at your event. Benefit Bidding staff are effective auctioneers and ringmen. We understand the fundraising environment better than a volunteer or celebrity. We can provide an auction quality surround sound system to make sure the auction is clearly heard and understood. To learn more about live fundraising auctions visit our blog site at www.benefitbidding.org. If you want to take your fundraising to another level, consider adding an online auction to the live event.